Hellmann’s mayonnaise formula: Why does this high-amplitude condiment taste so good? 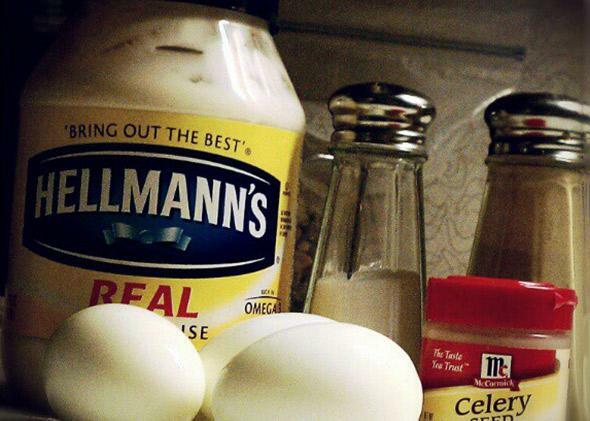 Why Is Hellmann’s Mayonnaise So Darn Good? An investigation into the amazing qualities of a 100-year-old condiment. Elsewhere in Slate, David Merritt Johns asks why mayonnaise inspires fervent hatred and explains the history of mayonnaise. Meanwhile, Katherine Goldstein argues in favor of a surprising mayonnaise alternative. Hellmann’s mayonnaise, which celebrated its 100th birthday this year, is a pioneer among mayonnaises, a creamy, tangy conqueror of bellies, hearts, and nations. Today, mayonnaise is the top-selling condiment in the nation, and Hellmann’s (known as Best Foods in the Western U.S.) supplies nearly half of that market. For many mayo lovers, Hellmann’s is like home: They may range far and wide, making their own or buying boutique brands, but they’ll always come back to Hellmann’s. Like a first kiss, Hellmann’s is what got them into the game and has become the standard by which all others are judged. Joanne Seltsam is a professional taster with Sensory Spectrum, Inc., a consulting firm that focuses on how the senses relate to consumer purchasing decisions. She specializes in descriptive analysis, or the identification of attributes and their intensities in food. Seltsam considers Hellmann’s a rare, high-quality product, a member of an exclusive group of products that are so refined and sophisticated that it’s hard for the average palate to break them down into their component flavors. “The tribute to Hellmann’s is that it is so difficult for even a trained person to break down, to find the line between where one attribute stops and the other starts,” Seltsam told me. “It’s what we would call a beautifully made product. It just tastes like mayonnaise. All the flavors blend together. They’re balanced. Nothing sticks out. Everything is appropriate. … Hellmann’s is just so interwoven that tasters have a very difficult time saying anything other than ‘it tastes like mayonnaise.’ ” Seltsam compares Hellmann’s to Coca-Cola: Both are flavors that many can identify but few can describe. There are likely a lot of food executives who would like to know what those “slight tweaks” have been. But even left to their own devices, other brands have started nipping at the heels of Hellmann’s. Kraft Mayo has only been around since 1988 but has already claimed nearly 24 percent of the mayonnaise market. And some believe that other mayos have come close to cracking the Hellmann’s formula. An October issue of Consumer Reports compared Hellmann’s to various store-brand mayos, enlisting about 50 employees who purported to be loyal to Hellmann’s to do a blind taste test. The survey found that 41 percent actually preferred the Target brand of mayonnaise, Market Pantry, to Hellmann’s. This result was hard for me to believe, so my wife helped me conduct a blind taste test between Hellmann’s (Best Foods, actually) and Market Pantry mayo. I also included Kraft Mayo in the trial. Even though I hadn’t gone home to Hellmann’s in a while, it was quite easy for me to distinguish it from the other two. Hellmann’s had a sharper, more piercing flavor that came together as if on the head of a pin, with no discernable oil flavor. Market Pantry and Kraft Mayo both tasted like duller versions of Hellmann’s. While they didn’t possess off-notes, there was a discernable oily flavor. Market Pantry and Kraft Mayo were much harder to distinguish from each other than from Hellmann’s, despite the Market Pantry having 20 more calories per tablespoon than both Hellmann’s and Kraft. (Perhaps Consumer Report staffers like their fat.) But when served with food—Indian leftovers, to be exact—the differences among the mayos became less obvious. The Consumer Reports team concluded that four store brands—Whole Foods, Walmart, Costco, and Target—were “just as good” as Hellmann’s and worth considering given how much cheaper they are. Even if this were true, Hellmann’s dominance might be stronger than that result implies. Aside from the question of which mayo is superior, Dr. Debra Zellner, a food psychologist at Montclair State University, told me via email that she thinks Hellmann’s is the most popular because it is the most popular. “People tend to be a bit neophobic (are afraid of new foods) and like the familiar (the more familiar the better). They will tend to like, and therefore choose, products with which they are familiar.” In other words, people who grew up eating Hellmann’s will continue to prefer Hellmann’s. Hellmann’s benefits from a phenomenon Zellner calls “mere exposure,” which means that the more people are exposed to something—a prominent mayonnaise brand, for instance—the more they like it. One thing that sets Hellmann’s apart from most other products known for their high amplitudes—Lindt dark chocolate, Pepperidge Farm Bordeaux cookies, Coke, Heinz ketchup, and Sara Lee pound cake are often named—is that mayo is an ingredient as well as a condiment. Jones, the chef, explained its versatility: “Hellman’s is more impressive than the balance and beauty found in Coke or Heinz. … The magic that sets mayonnaise above Coke and Heinz is that mayo is a perfect flavor carrier. While it may be beautiful on its own, you can make mayo taste like anything,” Jones says, by adding other ingredients. At this point, Jones was talking about mayonnaise in general, not just Hellmann’s. But that’s the point. Here is a top chef who’s well-known for pushing the boundaries of mayo and is still using the words Hellmann’s and mayonnaise interchangeably. Hellmann’s is mayonnaise. And mayonnaise, for the majority of users, is Hellmann’s.